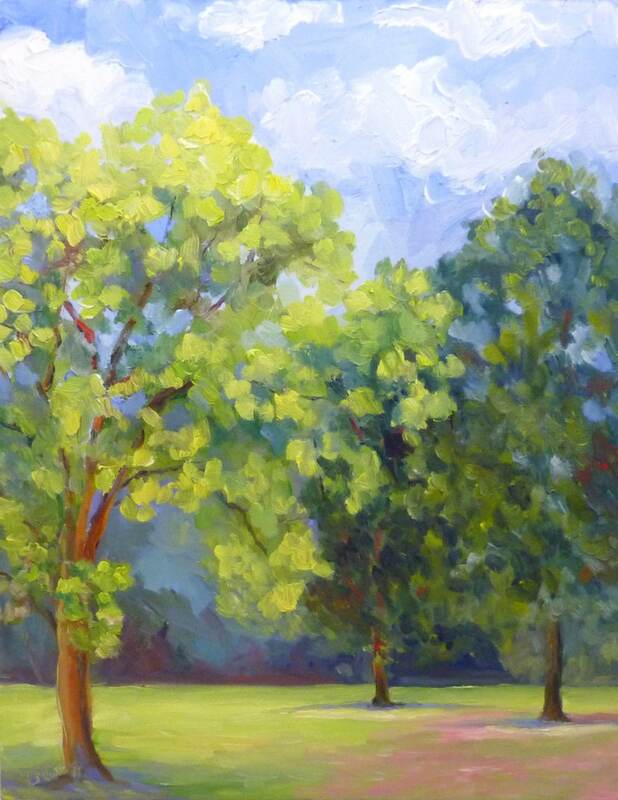 Large plein air oil painting for sale on canvas. This fine art plein air painting captures the beauty of trees on a summer afternoon. I was inspired by the beauty of the landscape and the rich colors it contained. This vista with its soft shadows and rich foliage had a way of drawing me deeper into the landscape. There was a nice mix of both warm and cool hues along with an expressive blue sky. This original painting was painted on site along the Lenape Trail in Plainsboro, New Jersey. The trail runs along a small pond in the area. It's always full of wildlife and the texture of nature. In painting this artwork I used a lot of visible brushwork which for me is often an expression of the texture and complexity within a landscape. There is an array of vibrant color as well which was indicative of the day. The artwork measures 18" x 14" and was painted on a canvas panel in oils. It is a signed original that is ready for framing. If you have any questions on this painting or others in my shop please convo me.